It will take one hundred years to return the High Tatras to how they were before this weekend’s storm, experts said Monday. It is allegedly the biggest catastrophe in Slovakia in the last 100 years, with damages reaching SKK 1 billion (USD $254.7 million). Slovak President Ivan GaÅ¡parovič has called for a total deployment of the army to affected areas, and Defense Minister Juraj LiÅ¡ka has agreed to the request. “The consideration to place soldiers in these areas is the widest, not only in terms numbers, but also from a time standpoint. We will not set a time limit and will help there as long as it will be possible, necessary and in agreement with the law,” LiÅ¡ka said after meeting with President GaÅ¡parovič. People cannot get over the view over a sixty-kilometer-long and ten-kilometer-wide area from PodbanskÃ½ to Å½diar. The area was originally covered with coniferous forest, but now looks like a moonscape. “My friend had a cottage in the middle of the forest. Now it is in a field where there are no trees for far and wide. A terrible view,” said one resident of TatranskÃ½ Matliar. Just cleaning up the damage will last from two to five years, and planting new forests will take up to 20 years. People from Tatra villages can see all the way to Poprad. “It’s a mournful sight. Renewing the Tatras is not a matter for local residents, but for all of Slovakia,” VysokÃ© Tatry mayor JÃ¡n MokoÅ¡ said. Hotel owners see the coming tourist season darkly. The windstorm damaged hotels and destroyed ski lifts. “Several popular ski slopes have disappeared under piles of trees. Places where you could ski several days ago have hundreds of fallen trees,” said JÃ¡n Gavalier, who works for a ski lift operator in VysokÃ© Tatry. The situation is bad on the slopes of Jakubkova louka and Jamy, but slopes at Å trbskÃ© pleso should be in operation next week. Slovak Environment Minister LÃ¡szlÃ³ Miklos marked the situation as the greatest ecological catastrophe in the last 100 years. “When you imagine that it will take more than 70 years to regain what we lost Friday, it’s a terrible thought,” he said. He pointed out that the calamity will increase runoff next spring, when snowpacks will melt, leading to increased risk of flooding. “It also increases the danger of erosion, and the microclimate, flora and fauna will change,” he added. Slovakia has requested aid to repair damages from the European Union. The money should come from EU structural funds. Agriculture Minister Zsolt Simon left today for Brussels. Friday’s winds completely destroyed 12,000 hectares (46.23 square miles) of forest on the lower slopes of the Tatra National Park. 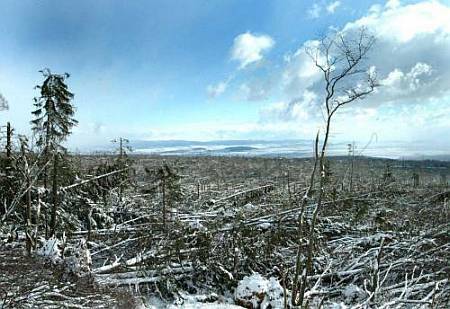 The wind destroyed nearly half of the central section of the Tatra forest, which has a total area of 25,000 hectares. Another 12,000 hectares were partially damaged. UPDATE 13:31 221104: Pictures of some the damage can be found here. I lived in Kosice, Slovakia, for a year, and visited the beautiful Tatras often. I am saddened by the devastation the windstorms left behind, and hope that one day I can show my family the mountain range restored.